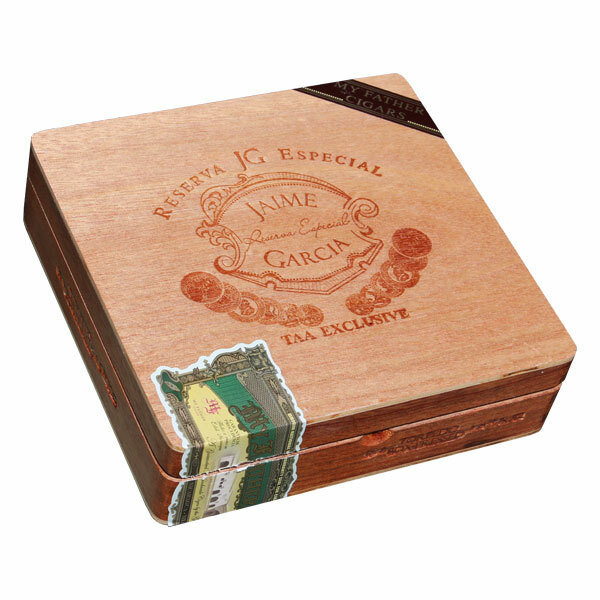 Jaime Garcia Reserva Especial is a fan-favorite blend within the My Father Cigars portfolio. The cigar was released in 2010, adding a dark and gritty Connecticut Broadleaf blend to the quickly-growing My Father brand—blended by (and named for) for Jaime Garcia, son of the world-renowned Nicaraguan cigar blender, José "Pepin" Garcia. In 2011, one year after the cigar’s introduction, the blend was tweaked for a special release: Jaime Garcia Reserva Especial TAA 2011. Using a new, 6⅛” x 52 box-pressed torpedo vitola, the blend was subtly altered for a more robust experience to go along with the exclusive shape. Now, six years after the original release, My Father has rotated through a number of their core-line cigars for their annual TAA releases and has opted to bring back the Jaime Garcia Reserva Especial TAA for 2017! Being one of the most sought-after cigars ever released in the exclusive TAA series, My Father has rolled the exact same 6⅛” x 52 box-pressed torpedo for the new Jaime Garcia Reserva Especial TAA 2017. Not only this, but it’s been hinted that the tobaccos used have been aged much longer than the original-release product. Experience the gritty and robust notes of earth and dark chocolate, balanced perfectly by sweet vanilla and espresso flavors that have made this a legendary cigar within the famed My Father Cigars lineup!